When did Russian intelligence give WikiLeaks the e-mails that it hacked from the Democratic National Committee and John Podesta, and how did it transmit them? Shortly after the election, James Clapper, then the director of National Intelligence, testified before Congress that American intelligence officials could not pinpoint these facts. Today, almost two years later, and after months of investigation, we know a lot more than we once did but Indictments are not the same as intelligence reports. Sometimes intentionally written ambiguously, to give prosecutors flexibility in the way they prove their case by emphasizing the strongest links in an argument to imply a bigger picture but are technically the weakest evidence. It is likely that the charged G.R.U. officers will never face trial….the New Yorker Magazine, Daily edition. Former Trump campaign manager Paul Manafort denied a British newspaper’s report that he met with WikiLeaks founder Julian Assange several times, including when he worked for the president’s campaign. “This story is false and deliberately libelous. I have never met Julian Assange or anyone connected to him. I have never been contacted by anyone connected to Wikileaks, either directly or indirectly. I have never reached out to Assange or Wikileaks on any matter,” Manafort said in a statement released by his legal team. And so Manafort is back in the news and Assange with him. Manafort we covered in August during his trial. We got part of it right but the charges were so large we got the bulk of it wrong. That said, the UK has a different libel standard than we do and over there, the Guardian must prove their case; in America as seen in the Woodward & Bernstein case against President Nixon (way back in 1973), journalists have carte blanche in what they write, up to a wide mark, and if they have enough money to bankroll the ensuing legal fees, never proving their story and for the Washington Post duo they never did. Hence with the Guardian vs. Manafort case, things should prove interesting, if it comes to trial; settlements are often the thing. As for Assange, the man who has single-handedly brought “white” hair into vogue has been hiding out in the Ecuador embassy in London for almost 7 years now because of extradition charges from Sweden and the U.S; at least it wasn’t Honduras where he’d tossed to the caravan and things are getting ugly down there. A psychedelic Yod for Mr. Assange. We worked hard on rectifying Julian’s ascendant to 02 Sagittarius, “Tents along a forest trail with sleepers in them” highlighting his ability to have his home in hat and dream of better times. Right next to it, is Neptune that shows us two things, that he considers himself a maverick in ferreting out the truth no matter how he may come upon and that he gets depressed from his frenetic lifestyle (and who wouldn’t?). Neptune mythologically is just a conduit, and so is Assange. It’s not really something tangible the Ocean, it’s just there, something we use, entertain and wash from, and that analogy works well with Assange: other people give him things, he finds out if there are legitimate through his bevy of rivers and messengers and personnel, and then he releases them into the Ocean and the world at large. Since that is how he sees himself, we used that aspect of his personality within his chart and see if it holds up. Assange has ADMETOS at 03.48 Taurus in the sixth house, an inconjunct away. Admetos is a TransNeptunian (hypothetical) planet of Mr. Alfred Witte’s who attributes it to being the graveyard of either personal or collective information that wants out. Here in Taurus, it suggests seeds being planted for Assange to begin his work. Sextile Admetos is Vulkanus at 04.53 Cancer conjunct the Sun at 10.18 Cancer in the eighth house. The Sun in the eighth is a tricky place wanting to do the dirty work that other’s dislike, and here next to Vulkanus, we see that for Assange it is almost a compulsion because of his enforced captivity like a Lion behind Bars roaming and searching for something to fill up his time. 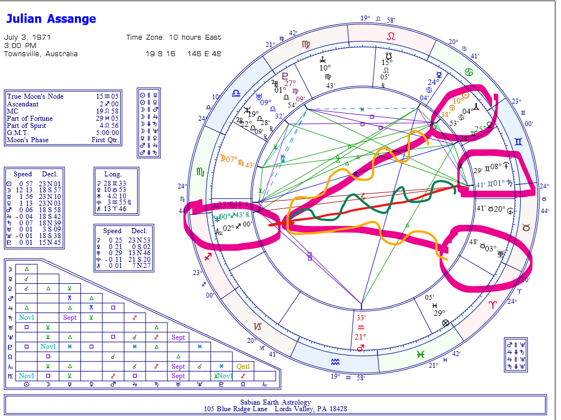 These planets then point back to the Ascendant/Neptune conjunction in the first house, so his apex becomes (follow the green squiggly line) to Saturn and Kronos showing that this had put him into a leadership role with others and because of that he has taken on the role of Grand Inquisitor towards the Great Powers of China, Russia and the US. Because the foot is at the Ascendant, it tells us that his timing is always superb and then even manacled by a billion rules by the Embassy; he is on target with his delivery and goods. That makes Assange everyone’s enemy, and unfortunately he will be in the Embassy, Moon in the twelfth, for what could be a long time. In the meantime his eleventh house of fans and well-wishers is chock full of planets including Poseidon right next to Apollon suggesting that his intellectual vision is cosmopolitan and global. In the tenth house he has ZEUS, showing how he controls others via its semi-sextile to URANUS electronically through his ability to accumulate large sets of data. Attached is Julian’s charts without our markings. In other news, Donna van Toen is now in the hospice in St. Michael’s. God Bless her and her daughter Bonnie in this long trial.